At 10:58 am ET yesterday we watched the successful launch of Orb-D1 from the Mid-Atlantic Regional Spaceport (MARS), Wallops Island, Virginia. SSEP delegations from Russell County, Virginia; Howard County, Maryland; San Marino, California; and NCESSE were on hand. Aboard the Cygnus spacecraft is the Falcon I payload of student experiments for SSEP Mission 3 to the International Space Station. Rendezvous with the International Space Station, followed by capture and berthing, is scheduled for early Sunday, September 22. Capture is scheduled for 7:17 am ET. NASA TV live coverage will begin 4:30 am ET. NCESSE will put up a NASA TV window via a SSEP blog post right here, and notification of the post will be sent to all subscribers of this blog (you can subscribe at the bottom of the right column). All Falcon I student flight teams are now preparing for the start of on-orbit and ground truth operations. For student researchers to mirror on-orbit operations in their ground truth experiments – which is critical for the success of the flight experiments – details of all ISS crew interactions with the experiments need to be relayed to the student research teams in a timely manner. Details of crew interactions will be relayed from orbit to Marshall Space Flight Center, to Johnson Space Center, to NanoRacks, and then to the National Center for Earth and Space Science Education (NCESSE). NCESSE will then post all activities in a formal log for the student research teams. Details of all activities on-orbit will be posted in the log within 24 hours. Explore the SSEP Mission 3 to ISS: Experiment Log page, which became operational September 17. Below is a NASA photograph of the launch taken in the infrared. 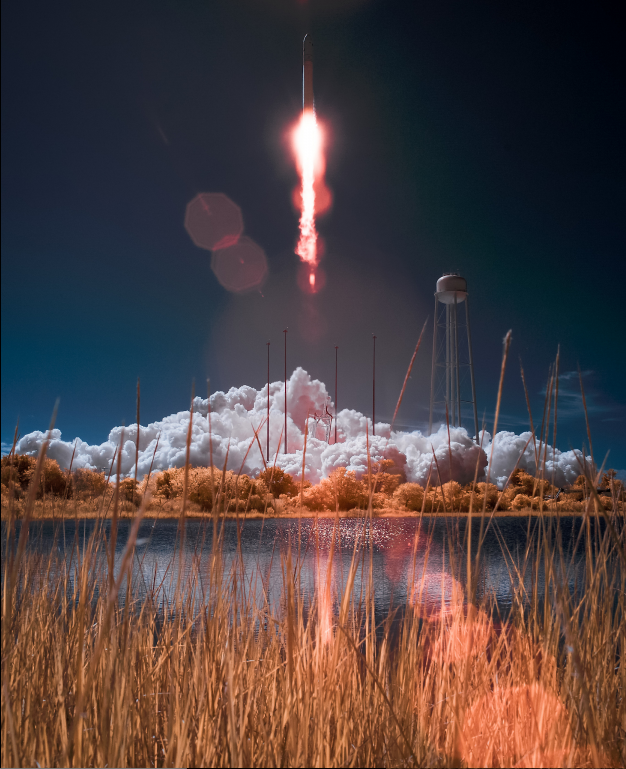 The Orbital Sciences Corporation Antares rocket, with the Cygnus cargo spacecraft aboard, is seen in this false color infrared image, as it launches from Pad-0A of the Mid-Atlantic Regional Spaceport (MARS), Wednesday, Sept. 18, 2013, NASA Wallops Flight Facility, Virginia. Cygnus is on its way to rendezvous with the space station. The spacecraft will deliver about 1,300 pounds (589 kilograms) of cargo, including food and clothing, to the Expedition 37 crew. Editor’s Note: This image is a false color infrared image made from a modified digital SLR camera.